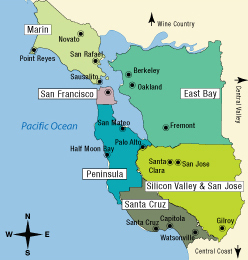 Northern California’s “Bay Area” is quite large — about 100 miles north-to-south and 50 miles east-to-west — and most tourism resources sub-divide the area into smaller regions, as we have on the San Francisco Bay Area tourist map to the right. North of San Francisco’s Golden Gate Bridge, you’ll find Marin County, and the East Bay is (you guessed it) to the east. The area directly south of San Francisco is known as The Peninsula, while the Silicon Valley/San Jose area stretches inland and further south, all the way to Gilroy, the “Garlic Capital of the World.” The southerly extension ends at the beach towns of Santa Cruz and nearby Capitola, and then the Bay Area extends inland a bit to include Watsonville’s own little agricultural wonderland (where you can attend a “Strawberry Festival” in August). Each of these smaller Bay Area regions has its own tourist attractions and experiences to enjoy, as well as its own array of tourism resources (hotels, resorts, restaurants, etc.). Marin is most often taken in by car, going to Mt. Tam(alpias), Muir Woods, Stinson Beach and Point Reyes. 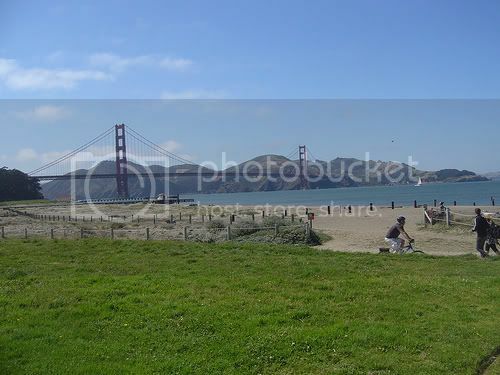 You can also catch a ferry to Sausalito from San Francisco’s Fisherman’s Wharf or the Ferry Terminal (at the foot of Market Street), and you can take a wonderful walking / biking tour of downtown Sausalito (map and five-mile loop tour). Be sure to stop and see the Bay Model (item 9 on the map) — it’s unique and very cool! Tourist maps for the East Bay tend to focus on Berkeley, especially the downtown area (map) and locations in and around the University of California’s Berkeley campus (campus map and self-guided tour). Also, if you’re visiting Oakland sometime between May and September, you might want to check out these free walking tours of the area. While maps of the Peninsula, Silicon Valley and San Jose may be a bit harder to find, here is a fun tour of Palo Alto — the focus of which is the city’s quirky trompe-l’oeil murals. If you make it to Palo Alto, be sure to check out the building at 165 University Avenue, which served as the original headquarters for several now-giant companies like Google, Logitech and PayPal. (It’s easy to see why it’s fondly referred to as “the good karma office,” eh?) And, if you’re in that area, you may also want to make time to tour the Stanford University campus. (If they fix the “Get the Map” link on this page, here’s a map to the campus’ extensive collection of outdoor sculptures. Don’t forget your camera!) This page provides a good overview of downtown San Jose historic district’s buildings, which you can combine with this map for a do-it-yourself walking tour of California’s third largest city (trailing Los Angeles and San Diego). Last, you can find resources here for Santa Cruz self-guided walking tours. And, be sure to check out these Santa Cruz area beaches when you’re there! 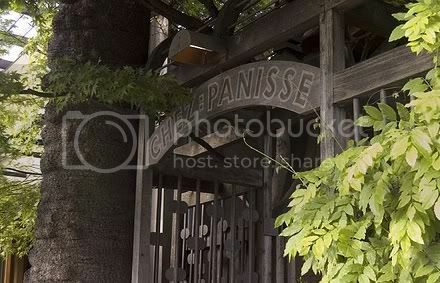 Photo of “some red bridge” (San Francisco’s Golden Gate Bridge) by burge 5000 via flickr (Creative Commons) and Photo of Berkeley’s Chez Panisse restaurant by ulterior epicure via flickr (Creative Commons).